Since HP’s TouchPad firesale brought prices on the tablet down as low as $99, a number of you have picked one up, and so have we. Since HP chose to use its own proprietary webOS operating system, not all of your favorite apps may be here, but fear not. We’re here to help. There are a number of great apps specifically built for the TouchPad, perhaps more than Android tablets currently offer. Below are a few of our favorites. HP wants to sell its PC business, kill webOS: So what happens now? Before you read all those articles, check out these apps! 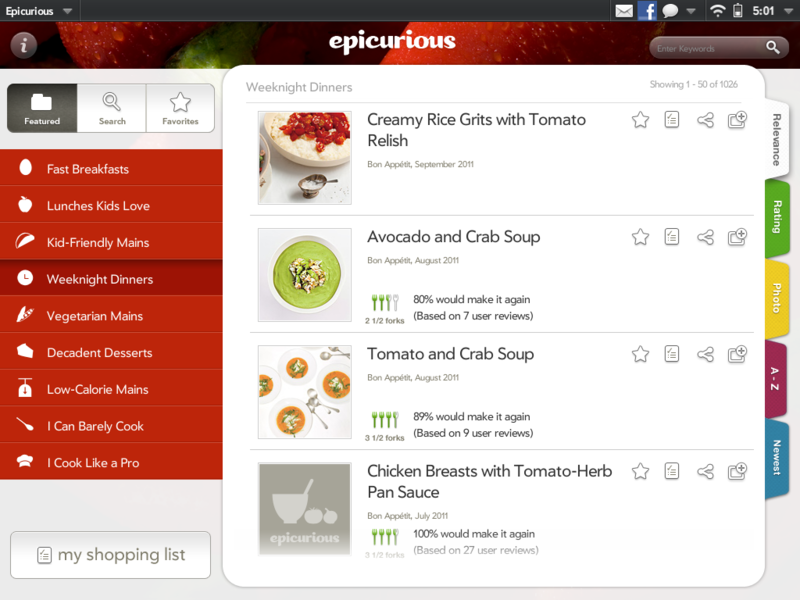 Epicurious Recipes (Free): The TouchPad has some good apps, but for its purpose, Epicurious may be the best recipe and cooking app we’ve tried on any tablet platform. The app lets you choose from 30,000 recipes (or submit your own) and its instructions are straightforward. Best of all, if you choose a recipe, it will automatically add the ingredients to a shopping list, so you know what you have to buy. Recipe sharing is easy, too. Glimpse ($5.00): Glimpse costs a few dollars, but it’s probably the largest and most full-featured app available for the TouchPad. It’s actually an app full of little apps (or widgets). Glimpse lets you connect to RSS, Twitter, weather reports, YouTube, has a browser, stocks, Google Reader, Read It Later, and other services. But it’s more than that. Much like one of the upcoming features of Windows 8, Glimpse lets you run two or three of its apps at the same time. Listen to music while you read Twitter, check your RSS while you watch YouTube, etc. It’s a very cool idea and works well. Check it out. Accuweather for HP TouchPad (Free): The weather is kind of boring, but we all want to know about it. Accuweather has interactive maps, emergency warnings (in case a giant hurricane is barreling toward your city), disease and outdoor warnings (how common is the flu in your area right now? ), video updates, and an extended forecast. Angry Birds HD (Free) and Angry Birds Rio HD ($1.99): The TouchPad has a few good games on it like Robotek and Radiant, but Angry Birds is still our favorite. 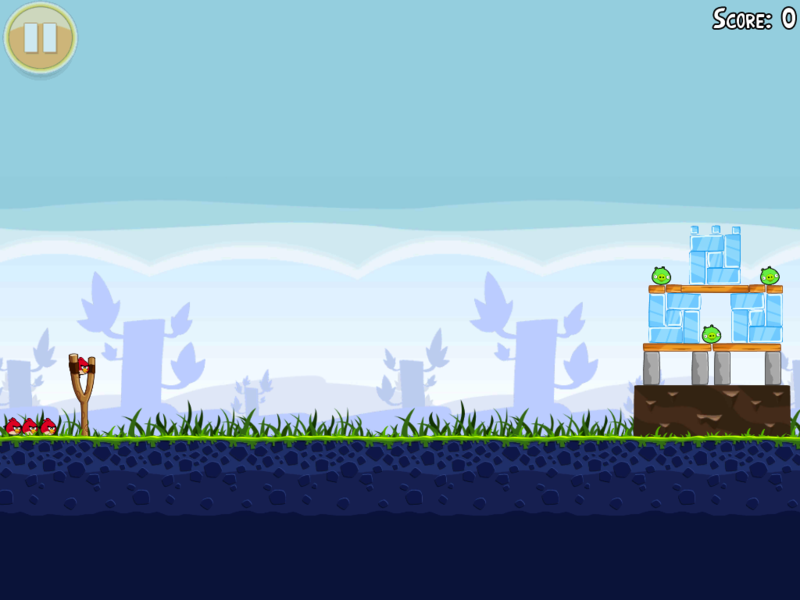 Unlike most games studios, Rovio has fully adapted Angry Birds to the TouchPad. It looks pretty and runs smoothly. Enjoy your pig and bird massacre. Camera for TouchPad (99 cents): The TouchPad has many great qualities, but it’s lack of a rear camera is somewhat disappointing as is its lack of camera software for its 1.3-megapixel front-facing camera. This app lets you take pictures with the front camera using the volume rocker as a shutter button. This lets you attempt to aim it at things other than your face when you take photos, but the process is still a bit difficult. Still, it’s something. TuneIn Radio (Free): For those of you who like radio and podcasts, TuneIn is a good option. It lets you instantly connect to stations and programs from sources like NPR, and has a good database of podcasts to subscribe to as well. It also lets you look up an artist or song and listen to it if its playing on any radio station. We recommend RadioLab if you’re looking for a particularly amazing radio show. HP Movie Store (Free): Unfortunately, Netflix, Hulu, Amazon OnDemand, YouTube Movies and Vudu are all absent from the TouchPad. 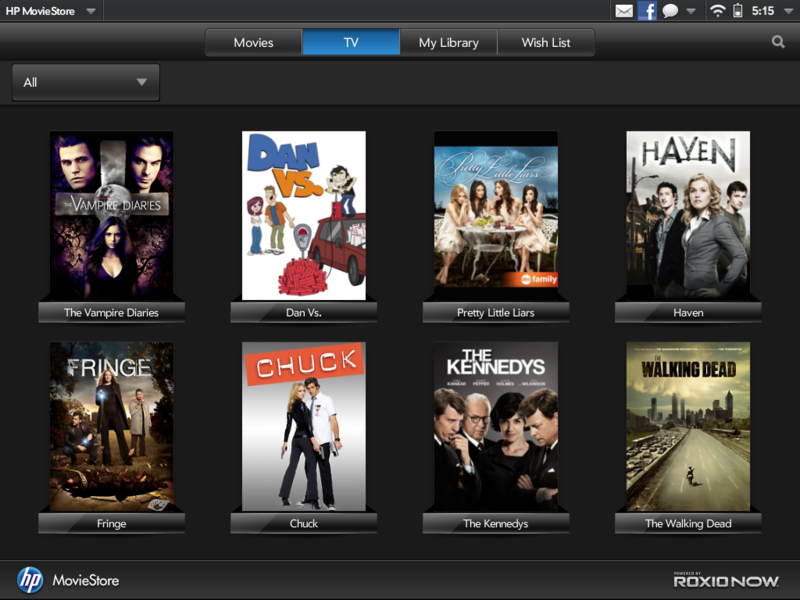 If you’d like to rent (please don’t buy) a new movie for your TouchPad, HP’s Movie Store is the best and only option. We didn’t have a problem with it, found it had a good selection of TV shows and movies, and its rental prices are a standard $2.99 to $3.99. InterfaceLIFT HD (Free): Interface LIFT is a pretty simple app. It has a library of photos that you can use as wallpapers. That’s it. Surprisingly, adding a wallpaper to our TouchPad has really livened it up. And hey, it’s free, so why not check out the many beautiful photographs available? Pandora (Free): If you want to download MP3s, then 7Digital MP3 music is your best option, but for some casual listening, Pandora is still king. Unfortunately, this app isn’t configured for the TouchPad, so it is small and runs on an emulated Palm Pre on your screen. Luckily, even shrinkified, Pandora still works. Mosaic Reader (Free): If you read as much news as we do (there’s almost no chance that you do), a good news reader is essential to your daily life. Mosaic Reader attempts to take a somewhat Flipboard-like approach and display stories and pictures in a mosaic of tiles, allowing you to glance around at your leisure. 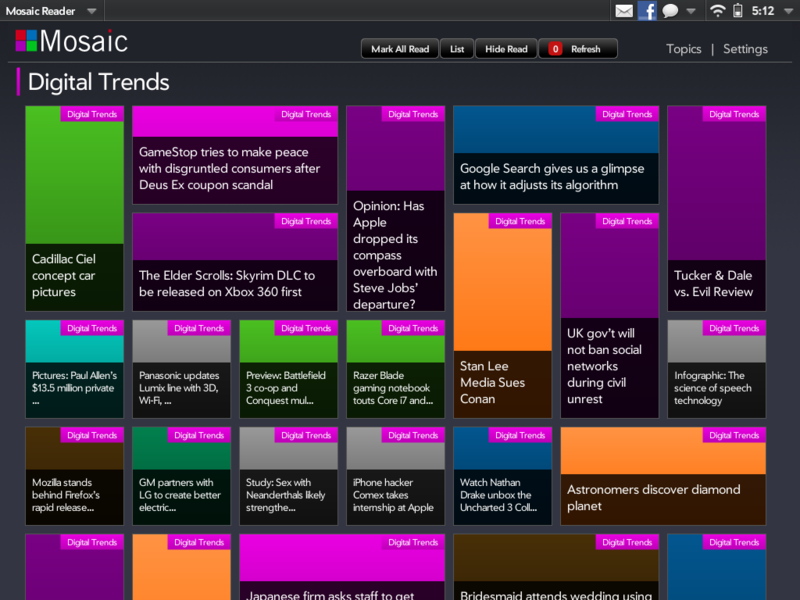 There is a certain art to apps like this, and while Mosaic probably isn’t the prettiest of the bunch (yet), it’s certainly a fantastic option and a great way to read news on the TouchPad. We’re especially fond of its support for Google Reader and Twitter, but even if you don’t have set up accounts, there are some decent preset groups of news sources for you to start browsing immediately. Did I mention that it’s free?